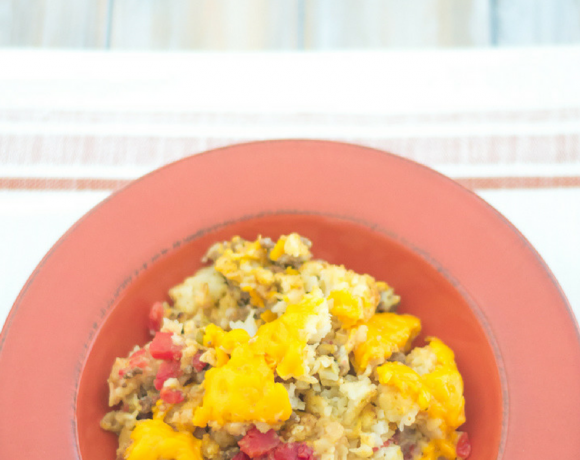 Crock Pot Spicy Peach Pork Chops is a sweet and spicy boneless pork chop recipe. The combination of spicy red pepper flakes and the sweet sliced peaches with light syrup is a perfect combination of flavors. Boneless pork chops are easy to make in the crock pot. 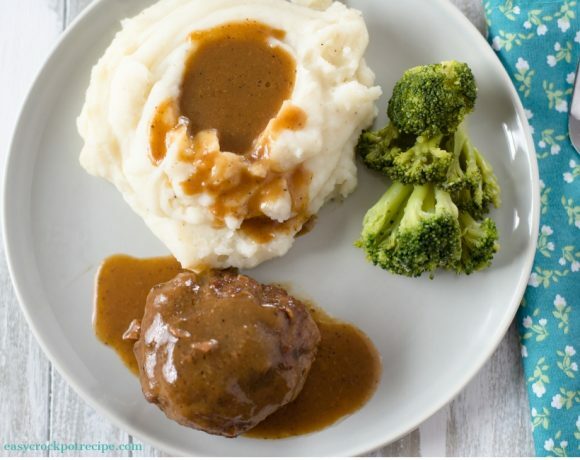 This crock pot pork recipe makes for moist and tender boneless pork chops. One of the easiest ways to cook boneless pork chops is to cook them slow in the crock pot covered in a sauce. Cooking boneless pork chops this way will guarantee tender boneless pork chops for dinner. Because boneless pork chops are so thin it is easy to over cook them and end up with a dried out hockey puck on the dinner plate. When you make crock pot spicy peach pork chops in the slow cooker the pork chop stays moist as long as you don’t over cook them. Very thin boneless pork chops might be cooked all the way through after 2 hours of slow cooking in a crock pot. Keep the thickness of your pork chops in mind when you begin cooking them. 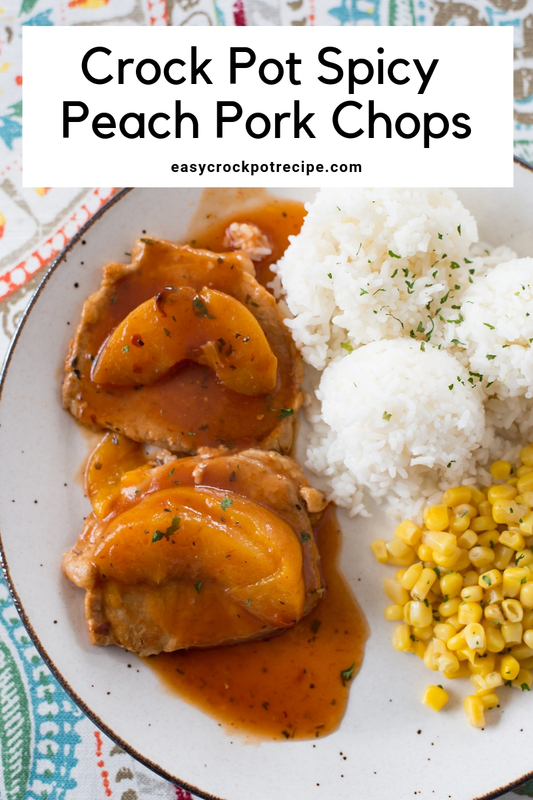 Crock Pot Spicy Peach Pork Chops recipe allows the pork meat to absorb the sweet flavor of peach syrup and the spicy flavor of the dried red pepper flakes. The sauce is a tomato based sauce and the sweet peach flavors enhance the tomato sauce while at the same time cutting back on some of the tomato flavor. 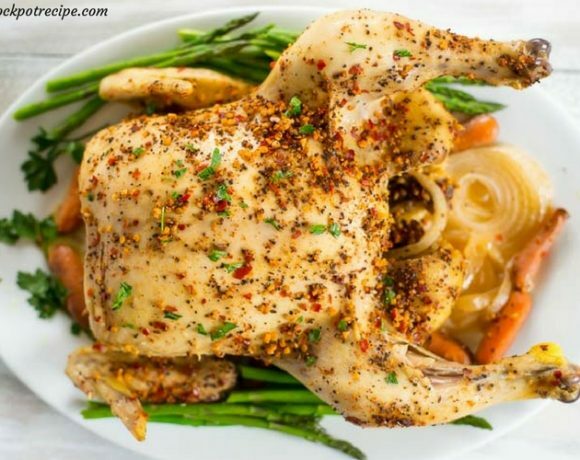 It is a perfect combination of acidic and sweet flavors when the two fruit flavors combine while they are slow cooking. 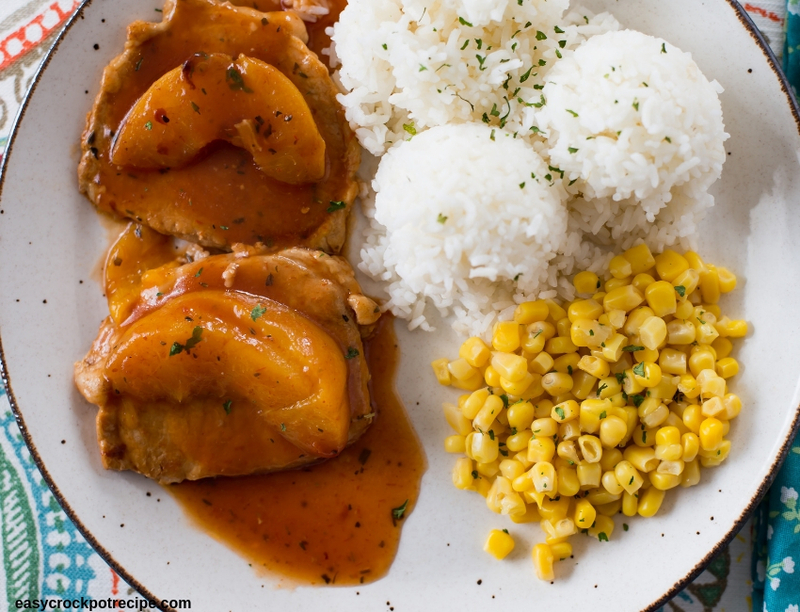 I served the Crock Pot Spicy Peach Pork Chops with cooked white rice and corn. 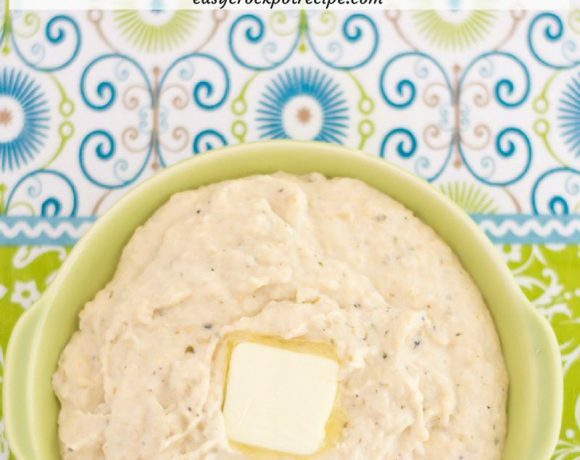 Mash potatoes would also taste delicious with this boneless pork chop recipes. The sauce can be spooned over the rice or potatoes if you like. Something wonderful happens when you combine pork with a fruit. It reminds me of how my mother always served apple sauce when she made pork chops. 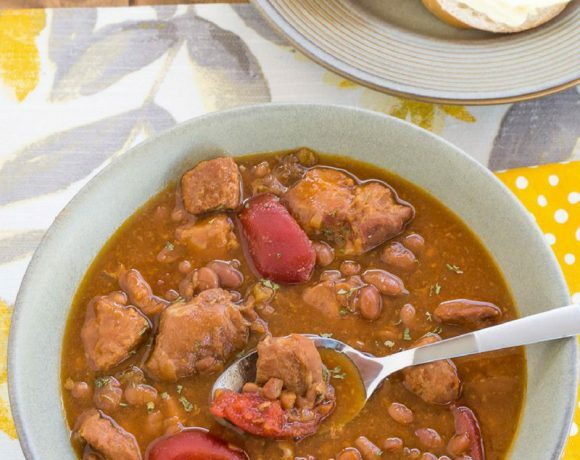 The sweet flavors of a fruit go perfectly with the flavor of pork. Cooking peach pork chops in the crock pot really helps add the flavor of the fruit to the pork. Heat the olive oil in a skillet. Brown the pork chops on both sides and place the pork chops in a single layer in a crock pot. Drain the peaches into a bowl, reserving the juice. 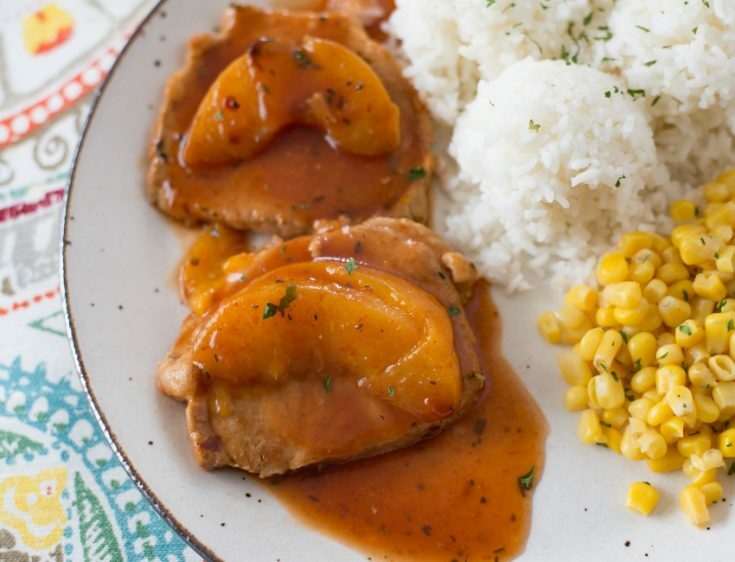 Place a peach slice on top of each pork chop. If you have any peach slices left place them around the pork chops. Add the tomato sauce, soy sauce, and spices to the bowl with the peach juice. Stir to combine and pour over the pork chops in the slow cooker. 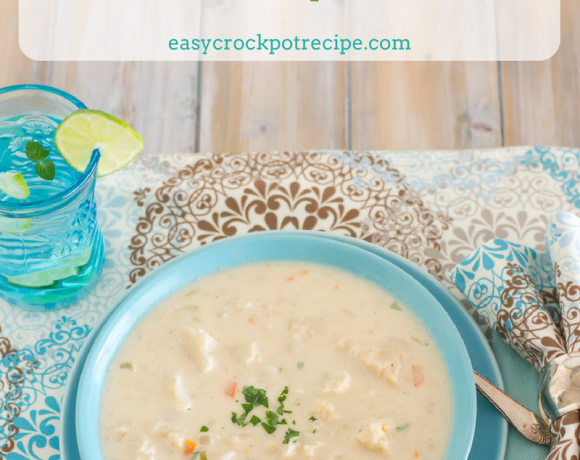 Place the lid on the crock pot and cook for 4-5 hours on low or 3-4 hours on high. Cooking time will depend on how thick the pork chops are. Thicker pork chops will take longer and very thin pork chops will cook much quicker. Do not over cook. About 30 minutes before the pork chops will be served mix 1 tablespoon cornstarch with 1 tablespoon cool water. Pour the cornstarch slurry into the crock pot and stir to combine with the liquids in the crock pot. Recover and allow the sauce to thicken and the pork chops to cook completely. Pork should be cooked to an internal 145 F. degrees. A meat thermometer is a good kitchen gadget to have on hand. Serve the Spicy Peach Pork Chops over a bed of cooked white rice or quinoa with a vegetable of choice. Print the Crock Pot Spicy Peach Pork Chops recipe below. Crock Pot Spicy Peach Pork Chops Recipe is the best way to make tender, sweet and spicy boneless pork chops.